Welcome to the guzheng studio website of Zheng Tang! 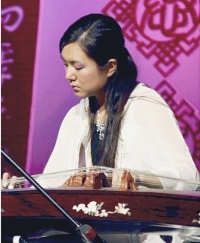 Zheng Tang is a second generation player from a family of traditional Guzheng players in China. She first learned to play from her mother, a student of Cao Zheng and Zhao Yuzhai of the Shenyang Conservatory. Zheng then studied at Shenyang herself under professors Yan Li and Yang Nani. She was awarded top level professional guzheng playing certificates from both the China Music Conservatory and the China Nationalities Orchestra Society in 2001, and has been teaching private classes at all levels since 1998. Some of her top students in China have achieved the highest certification levels from the China National Musical Instruments Artistic Cultivation Performance Examination Committee. Many have also won provincial and city awards. Zheng has nearly 15 years of experience teaching guzheng, and has taught both in China and America. Her students have been as young as 4 and in their 50's, and spanned all ability levels. A native Mandarin speaker, lessons can be conducted using Chinese, English, or both according to parents' and students’ preference. Besides guzheng, lessons are also offered for hulusi (a traditional Chinese flute). In total, she knows how to play more than 10 different instrumets, both Chinese and western. Zheng lives in northwest Columbus (Dublin), Ohio.